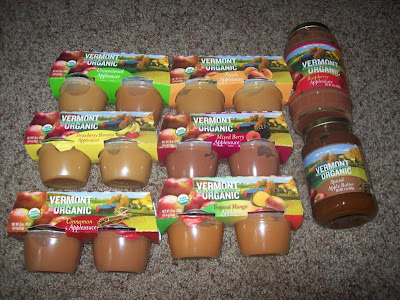 YUM is the first word that comes to mind when talking about this Vermont Village Applesauce that I was sent for review! I was sent a WHOLE bunch of flavors to try. My favorites were the mango applesauce and the peach. The mango was the smoothest applesauce that I have ever tried in my life. It was the consistency of a super smooth thick smoothie. The flavor is very fresh and not fake tasting. All of the applesauce is organic. The small containers only have 70 calories which is good. The peach was also to die for! Thanks Vermont Village for sharing your amazing applesauce with me! Hi! I'm your newest GFC follower from Social Parade. Would love it if you'd follow me back at Mom of all Trades. Hi, I'm stopping by from Social Parade! I'm you're newest follower! Would love if you also followed me! Thank you so much for linking up to my third edition of Friday Party Hop! following you back, thanks for hopping with me at iFiH today!